On the 29th September 1909 an indenture conveyed the ownership of Wigmore House in Castle Street, Thornbury from John Crowther Gwynn of Algars Manor to Dr Lionel Henry Williams. The obituary of Lionel Henry Williams in the Dursley Gazette says that Lionel was born at Woodlands near Pontypool and that he qualified for his medical degree at Bristol Royal Infirmary. The birth of Lionel Williams was registered in the Pontypool District of South Wales in the June quarter of 1862. The 1881 census shows that the family moved to Bristol and that Lionel lived in Beaconsfield Road with his 61 year old widowed father, Charles Williams, who was described as the County Registrar for Monmouthshire. At that time Lionel was aged 18. He was living with his three brothers (Reginald aged 20, Herbert aged 14 and John aged 10) and two sisters ( Lilian aged 17 and Beatrice aged 12 ) . The obituary tells us that after qualifying as a doctor he was house surgeon at York for a time. He came from York to Thornbury in about 1890 on taking over the practice of the late Dr Salmon. He married Edith Emily Commeline on 7th July 1891. Edith was born in Cirencester and was the daughter of Thomas Commeline a bank manager and thus she was the sister of Grace Commeline who also lived in Castle Street and Alice Commeline who had married Henry Hume Lloyd of Fairfield House, Castle Street. The 1881 census shows that the family lived in Gloucester, but by the 1891 census Thomas Commeline had died and his daughter Edith was living on her own means in Wells. She was lodging with the family of John Parsons, a commercial traveller and his wife Ellen. After their marriage, Edith and Lionel Williams apparently lived for about two years in Silver Street Thornbury before moving to Oriel House in Castle Street. On 6th July 1892 their first son, Geoffrey Commeline Williams was baptised at St Mary’s Church in Thornbury. The rate book of 1894 shows that Lionel Williams owned and occupied Oriel House. He also owned some agricultural land which we believe to be an area that ran down behind other houses in Castle Street including numbers 20 and 22. The Bristol Mercury of April 21st 1900 announced that Dr Lionel Henry Williams was appointed under the Factory Acts to be certifying surgeon for the parishes of Thornbury, Oldbury on Severn, Littleton upon Severn, Rockhampton, Falfield Charfield, Cromhall, Rangeworthy and Tytherington. On 31st October 1894 their daughter Edith Joyce Williams was baptised in Thornbury. The rate book of 1899 also shows that Dr Williams owned and occupied Oriel House. He also owned the property at number 6 Castle Street occupied by Maria Honeyborne. The 1901 census shows the family living in Oriel House. Lionel H Williams was a General Practitioner of medicine aged 38 from Pontypool in Monmouthshire. His wife Edith E Williams was aged 35 from Thornbury. They had a daughter Edith J aged 6. They had a visitor staying with them – Katherine Hill from Carlisle who was a spinster aged 30. They also had three servants who lived in the house. The birth of another daughter Nesta Marian was registered on the 15th January 1904. In 1907 Lionel was appointed as Medical Officer of the Workhouse and the Thornbury District in Health replacing E. M. Grace in that capacity. The deeds held by the owners of Wigmore House include a Conveyance of the 29th September 1909 which transferred ownership of Wigmore House from John Crowther Gwynn to Dr Lionel H Williams. Dr Williams raised a mortgage for £200 on the property dated 8th October 1909 from John Cole Cox Ponting, an ironmonger of Bristol. A further indenture of 27th April 1911 transfers the mortgage for £200 to his widow Mary Ann Ponting of 181 Hotwell Road in Bristol. The rate books of 1905 and 1910 reflect this change. In 1905 the rate book shows that the owner of Wigmore House was J C Gwynn but by 1910 the owner was entered as L H Williams. Lionel Williams continued to live in Oriel House, the property next door. It is interesting to hear from Dr Hilary Newton that Dr Williams and his wife Edith lived in Wigmore House for a time but she did not want to live there because of the ghosts. She preferred to live at Oriel House. Wigmore House was actually occupied by the Rev C H Travers Wright. At this stage we know nothing about the Rev Travers Wright, except that he appeared on the roll of honour of people from Thornbury who served in the 1914-18 war, which appeared in local newspapers of that period. The 1905 rate book confirms that Dr Williams also owned number 6 Castle Street (the house next to Oriel House and sometimes known as Oriel Cottage), which at that time was rented by Maria Honeyborne. He also owned the agricultural land mentioned earlier. The 1911 census shows Lionel Henry Williams aged 48 and his wife Edith Emily aged 45 lived in Oriel House. They had been married 19 years and had three children; Geoffrey aged 18, Edith aged 16 and Nesta aged 7. A governess, Grace Mary Hadley lived with the family and they had three servants. By 1914 the trade directory shows that Lionel Henry Williams of Castle Street was not only a surgeon but also a medical officer to the workhouse, medical officer and public vaccinator. The South Gloucestershire Chronicle of July 7th 1916 gave a small insight into the character of Edith Williams. It referred to Mrs Williams as “popular and energetic” and said that she was the Hon Sec of the Working Party in aid of Soldiers and Sailors and was holding events and meetings at Oriel House. An indenture in the deeds now held by the owner of Wigmore House confirms that the mortgage on that house was paid off by Lionel Williams of Oriel House on 13th July 1924. By this time the mortgagee Mary Ann Ponting was living in Egloskerry in Cornwall and her son Charles Ponting was living in Coburg Road in Montpelier in Bristol. We have a valuation of Oriel House dated 16th February 1931 made by the Public Assistance Board which said that Dr Williams was the owner of Oriel House and that he was asking what was said to be the very high price of £3,000 for it. The valuation put the property at nearer £2,000. It appears that Oriel House did not change hands at that time because the 1935 Directory still gives the address of Lionel Henry Williams as Oriel House. Edith Joyce Williams, the eldest daughter of Lionel and Edith Emily, died on 4th June 1937. A memorial service was held for her at St Mary’s Church in Thornbury. On Jan 19th 1938 Edith Emily the wife of Lionel Williams MD died suddenly in her sleep at Oriel House. The funeral service was held at Thornbury Church and followed by a cremation. The notice of her death said that during the First World War Edith Williams was Secretary to the Red Cross Working Party in Thornbury. She was also a founder member of the Thornbury branch of the Women’s Institute and an early member of the Mothers’ Union. She was also a governor of Thornbury Grammar School. Amongst the mourners at her funeral were Edith’s brother General F H Commeline and her niece a Miss Lloyd. Dr Williams practised for many years in Thornbury and for the last two years that he practised he was in partnership with Dr D C Prowse. Dr Prowse lived at Wigmore House but the surgery where they worked together was at number 6 Castle Street also called Oriel Cottage. After Dr Williams’ retirement the surgery moved to 20 Castle Street. On the death of his wife Lionel Williams had a residence built in the garden of Oriel House, which he called Ty Gardd (which we believe means Garden House or House in the Garden). Oriel House itself was acquired by the Thornbury Rural District Council as their central office in 1939. Dr Williams was said to be an artist of appreciable merit. 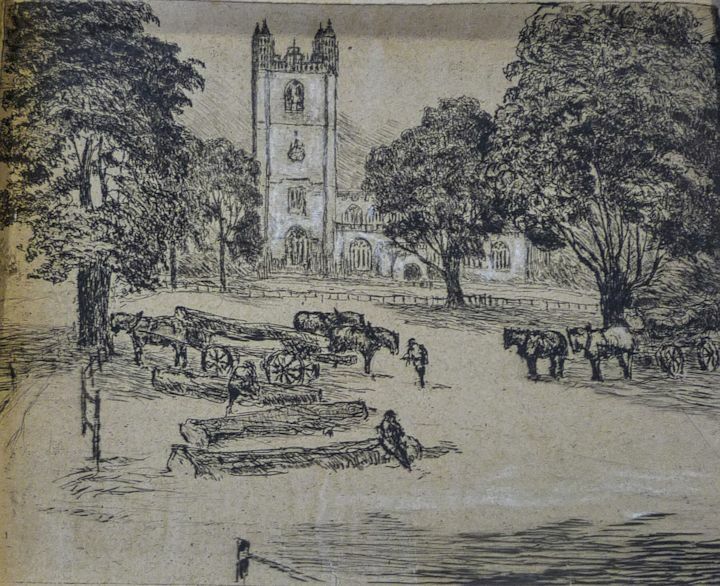 He painted some excellent water colours but he was particularly fond of etching and was able to continue this hobby until about three months before his death. We show one of his works here on the left. He was very fond of his garden and on his retirement he was a familiar figure walking about Thornbury with his faithful dog. Geoffrey Commeline Williams was educated at Cambridge where he obtained his MA degree. He served in the forward areas of France for two years during the Second World War and on leaving the army decided to take up public health work. He became Medical Officer of Health for Oxford. Here his work was so much appreciated that it was recognised with an honorary degree from Oxford University. As head of the Public Health Department at Oxford he had to organise his area to meet war time conditions and had to deal with thousands of evacuees from London including hundreds of expectant mothers. He was awarded the Order of the British Empire for his services to Civil Service. The Western Daily Press of January 23rd 1950 reported on the death of Geoffrey Commeline Williams O.B.E. , MRCS, L.R.C.P. , D.H.P. Edith Joyce Williams was the eldest daughter of Lionel and Edith. She was baptised 31st October 1894. She died on June 4th 1937. Nesta Williams grew up in Oriel House and then married Charles Bernard Robinson, a nursery man from Plymouth, on 30th November 1940. He was the son of Gerald Charles Frederick Robinson, a surgeon. The couple lived in the Nesta’s family home, the house that Lionel Williams had had built and which was called Ty Garth. We have been told by a local historian Ann Riddiford that Dr Williams also bought an orchard which ran behind numbers 20-22 Castle Street. Charles Robinson developed this into a market garden. Large greenhouses were used to grow salad vegetables and tomatoes. These he sold to local retailers etc he carried on the business until the 1980s.